The Ultimate Dream Home in Scottsdale with MyDomaine! I am so uplifted by the power of collaboration, creativity, and positivity that I can barely put that energy into words. It happened to me recently on a shoot in Scottsdale, AZ with the amazing Bria Hammel, and it was one of those days that so clearly affirms my belief in The New Southern’s message and encourages every day to make new strides that push our work forward. It was like the two of us spoke the same language. Bria and I were totally on the same page regarding our industry, styling, and design, but on a much larger level, we both believe that collaboration is the absolute key to building everyone up around you. She, like me, is a firm believer that the digital space is our new currency for making an impact and sharing love, light, and new ideas. When the two of us worked hand in hand like so many believers in The New Southern do, our finished product was so much more striking than I initially imagined. Bria approaches every situation with an open mind and a killer eye and together, we had such a contagious energy. I know I carried it on with me beyond that trip to Arizona and am radiating it even now, months later. The space is an absolute stunner—a vacation home with unexpected vignettes throughout and rich layering that makes for comfortable living and amazing photography. I’m so excited to share this project with you, and so many thanks to the friends at MyDomaine for making it happen! A Preppy Space in Portland with Domino Magazine! There's a new way to infuse preppiness into a space without a fussy or forced result. It's a look that Portland's Caitlin Wilson has mastered, who now has her own textile and furniture line to boot (Check out their NEW Dallas, TX location)..
Before, it was a southern design genre reserved for floral-upholstered tea rooms full of objects not to be touched or ladies-only enclaves in exclusive country clubs. 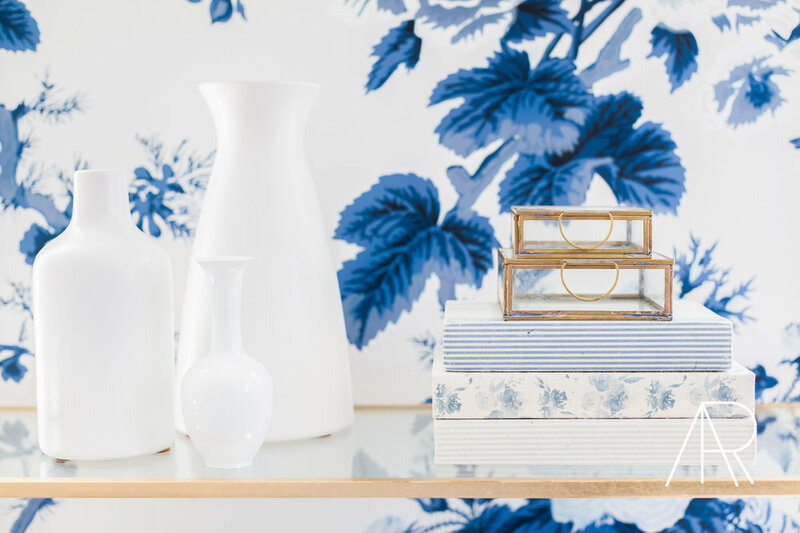 Now, the Preppy New Southern is full of light and room, dotted with punchy patterns and playful prints, full of classic blue and white combinations, and has a touch of charm at every turn. It's a kind of space that just fills you with joy when you enter it, which makes it such a delight to photograph. I recently worked with Caitlin in this amazing Portland home, designed with her playful eye for pattern and color and, of course, integrating so many textiles, rugs and accessories from her line. Although each room has its own unique feel, I just love her design consistency and the way each room melts into the next. She gravitates toward classic ginger jars, gingham, stripes and florals, but has this way of mixing them all to create the ultimate play on pattern. To achieve the look, she has such a great eye for product and I loved editing the spaces utilizing all her brand's accessories -- each room has just enough styling to make a statement without becoming cluttered or overwhelming. Knowledge is power and it is time to discuss something that we can all learn a little bit more about — Copyright. This very real and everlasting piece to all creative work has been making waves. As a leader within the architectural and interiors photography landscape, I find it necessary to provide you all with resources that will help you to grow while building healthy relationships around your images and accounts. I am making this into a blog series and encourage an ongoing discussion. First, we will cover the riveting topic of copyright AND what this means to both photographers and designers. Second, and in an additional post (HERE), I will dive into the do's, dont's and best practices for social media. The Photographer is deemed the exclusive owner of the copyright of that photo. the right to display the photograph. This means, as the copyright owner of a photograph you dictate what can and cannot be done with your photograph. So, if you want to condition the use of your photos with certain requirements (i.e., “sure friend, you can use my photos on your website as long as you tag and credit me”) or (i.e., “sure friend, you can post my photo on instagram as long as you post the lyrics to a Cardi B song or Wind Beneath My Wings as the comment”) the users of the photograph are obligated to comply. Bottom line: The copyright owner makes the rules and anyone who wants to use the photo needs to play nice in the theoretical sandbox. Here’s the thing, copyright ownership belongs to the photographer the moment they click the shutter UNLESS/UNTIL another arrangement is entered into with the photographer. If you want to be the copyright owner of a photograph, all you have to do is ASK (preferably in an email or by way of contract). Copyrights are transferable when negotiated and upon a case by case basis. This is my least favorite comment to deal with as an attorney, it goes something like this, “this photograph captures my intellectual property as an interior designer or an architect, so therefore I am the owner of the photograph.” Ummm, FALSE. That's not how copyright works and this typically rears its ugly head when egos get involved. The law protects the original works of art and authorship of photos, books, music, manuscripts, paintings.... ect. Such copying is called copyright infringement. So those are a few of the most basic copyright principles explored in the context of photographs. I am sure you all found that to be riveting! The final takeaway: if you understand how photo copyright generally works, you can navigate your professional relationships to get exactly what you want out of a photography session. The client/ photographer relationship can be very mutually BENEFICIAl when all expectations are discussed early on in the relationship. Thank you, Sarah, for the above comments and for walking us through a quick snapshot of copyright law. Having had a strong business background in the corporate world - I knew that I wanted to build a powerful and legitimate business as a photographer. This wasn't simply going to be a hobby for me. As a result, it has become a sustainable career which helps to support my family, my dreams and a growing team. I quickly learned that there are varying levels of business acumen when it comes to photographers and designers. There are those who are hobbyists without contracts in place and then there are those who have processes and procedures in place. It is these people who educate themselves within their rights. I believe the strength of your business lies in the foundation. My theoretical "bricks" are based on the law, the value I provide my talented clients and my passion for all to be successful. I own the rights and copyright to 99.9% of my images. The .1% is a special instance - a large commercial or celebrity entity with a 3rd party music label may be involved. Industry Standard when selling all rights to images, which is not frequently done, is to double or triple your rate (I have discussed this with many peers who span from Getty, WSJ, NYTimes, Arch Digest, Elle Decor contributing photographers). My designer clients have indefinite (lifetime) use of the images for their portfolio use and social media use. I have business and brand strategies which I implement for each client to help their businesses grow which aids in new clients. Any 3rd party request for images is redirected back to me and my team in which I accommodate. As a photographer, I shoot for my clients who are designers, architects, builders, shelter magazines and I also license images to commercial outlets. All of my contracts have a social media clause in place where photo credit is required in the comments section and tagging. I also design credit on all social media. I am flexible on a client by client basis when special needs or requests arise and, I am happy to meet these needs. I have my legal team review all commerical competition submissions. Most often this is a way for the company and its subsidiaries to own all rights to the images for free and this is done on a case by case basis depending on their terms and conditions. I am a client advocate. Any issues I have dealt with early on have been from those who don't value the photographer relationship, conduct shady business practices or those who let their own egos get in the way. The Goal is to have a mutually beneficial collaboration for the client and photographer. I value my relationships and act as an extension of my client's team aiding in their growth and success. It is a tremendous honor to work with THE talented designers across the country. I am passionate about their individual brands, and I believe there is room for everyone to be successful. If you want to sell product through another person's image, contact the rights holder.